"Crow Hopper's Big Guide to Buck Stopping: Put an End to Your Horse’s Bucking Fits"
For sale here by the book's actual author! This page offers the paperback version only. Click any of the above links to get more info or purchase. Control: Either you have it—or you don’t. If your horse went ballistic last week, it didn’t just “happen out of the blue.” He’s been saying for some time that he was going to lose it when enough pressure was applied. Learn to test your horse and spot the warning signs. Bucking horse owners, here’s something you can do with your horse from the ground that advances his training, is low risk, and downright fun. Perfect. Develop control over your horse’s individual body parts—and gain respect along the way. Backing your horse is an excellent way to affirm (or establish) your position as leader. With additional training for the bucking horse, here is the how, when, and why of lunge-line training. Diagnosing your horse is a primary step to charting your fix. Every horse needs to be schooled on each of the following. Sack out and desensitize your horse to scary objects—like your hands, tack and everyday equipment. Here’s how to teach your horse to contain himself (and thus, keep you out of harm’s way) when something scary pops out of the shadows. Here’s your plan in case your horse bucks before you can teach it not to. Core Lesson 1: Control over the horse’s hips allows you to tamp down or even shut down a bucking fit—but it’s also the key to lots of other stuff your horse can do. Core Lesson 2: The Swiss Army knife of training exercises, use this routine to warm up, cool down, lower your horse’s head, connect the rein to the feet, or to soften laterally. Get your horse giving to the bit, dropping its head and rounding its body, rather than bracing when you pick up the reins. More than simple body positioning, a relaxed and ready posture mirrors a horse that is mentally on board, a willing partner. Core Lesson 4: Regardless of what causes your horse to explode, speed control gives us a method to reproduce emotional moments under more controlled situations so that we can deal with them methodically, objectively, and on our own terms. If you have problems with your “high” horse—or need ways to slow a fast one down—then the following two chapters are for you. You’ve got to look for every opportunity to relax your grip on those reins. Quit pulling. Horses aren’t nags, neither should you be. Here’s what to do when your horse moves slower and slower on the way out of the barn—but faster and faster when headed toward it. Plus: The horse that won’t move. Core Lesson 5: Here, beginning with basic shoulder control, are two chapters included to fine-tune your steering. A horse that turns freely can be directed away from bad situations and is far less likely to go bananas when he wants to be here and you want to be there. You’ve taught your horse to turn by teaching it to place its feet where you’d like—now use that ability to get straight lines. Is it okay for your horse to buck the first time you put a saddle on it? How Can I Overcome My Fear After Being Bucked Off? Forcing your horse across obstacles without proper training is inviting trouble. Here’s how to properly prepare your horse to walk across scary objects like tarps and water and avoid fights. It’s also great pre-training for teaching your horse to load into a trailer. Training for every horse and rider—and an absolute must for those schooling the bucking horse. Here’s one small thing you can do to keep your horse’s attitude in check—and prevent mount-up problems from taking root. If your horse is given to mischief at the touch of your reins, it is critical that you become practiced with your hands, your primary source of communication. This is—with super-specific detail—how to pick up, handle, and release your reins. Is your horse getting duller to your cues? Do you make a request only to have him shoot you a condescending glance and go back to what he was doing? It might be that you’re not asking so much as badgering—and your horse has written you off. Wouldn’t it be cool if your horse spoke English and you could simply tell him what you were looking for when you’re riding? Well, ta-da! Here’s a trick to get your point across clearly, a technique that’s simple and easy to remember. If you’re guilty of being a bit heavy-handed (as evidenced by a stiff-as-a-statue horse) here’s a Top Five training concept that will soften your horse fast. How Do I Keep My Horse’s Attention? Is the Cinch Strap Causing the Trouble? When your horse seems uncharacteristically incorrigible, check that cinch area. Is My Horse Hard to Train... Because of His Feet? If your horse stumbles, cranes his head to the ground, takes halting steps, doesn’t want to “move out,” or has grown irritable, his feet might be hurting him. Here’s how to tell. Don’t let separation anxiety leave you in the dirt. Forcing your horse to leave his comfort zone or BFF is courting disaster, especially when he’s prone to dumping you in times of stress. Here’s a plan to solve the problem, one safe step at a time. The sample will open in a pdf document. Hit your "back" button to return to this page. ​Is your horse a powder keg? 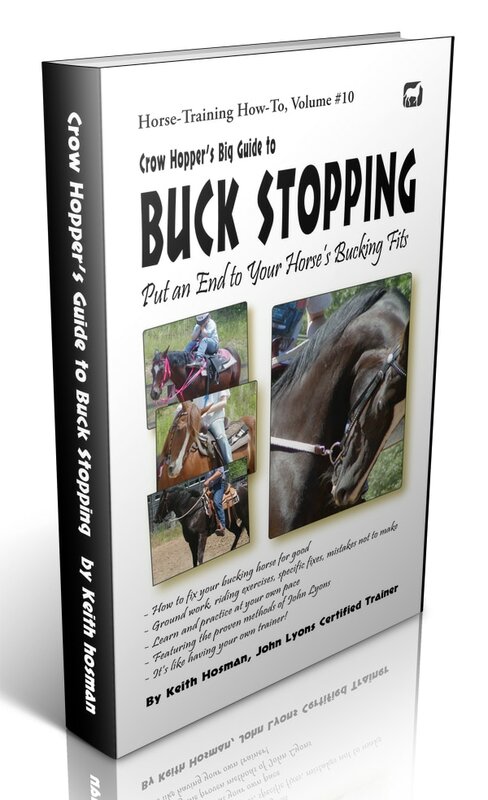 "Crow Hopper's Big Guide to Buck Stopping" is your guide to ending one very dangerous habit: Bucking. Learn ground work and riding exercises designed to re-train your horse's brain plus immediate fixes for horses that buck into the canter, freeze up, balk at obstacles and your own fear. Make riding fun again! Control: Either you have it--or you don't. Two words, "Either Or," are particularly appropriate when describing, owning, and handling the majority of horses that buck. Either they do it because they're scared or because they're defiant. Either you're the type of person who takes on the challenge with a gleam in your eye or you have a bad stomach over the very idea. Either your barn friends think you should sell the animal because they feel embarrassed for you and your odd excuses for why you exercise it via hand walks and turnout and never a ride on the trail -- or they're pretty sure you don't realize the risk you take each time you hop aboard and they're considering an equestrian intervention. And either you've got a plan to fix it--or you do not. Section I: Learn the ground work required to begin snuffing out this deep-rooted issue. Given that "you ride the horse you lead," you'll begin your fix with your feet planted safely on terra firma. You'll gain confidence and control. Section II: Learn to see a buck coming and what to do if it happens, then get back in the saddle for exercises designed to put you in charge and prevent future problems. Section III: Perform exercises geared to address immediate and specific bucking issues: Bucking into the canter, how to deal with your fear, crossing obstacles, the horse that crow hops when first introduced to the saddle. 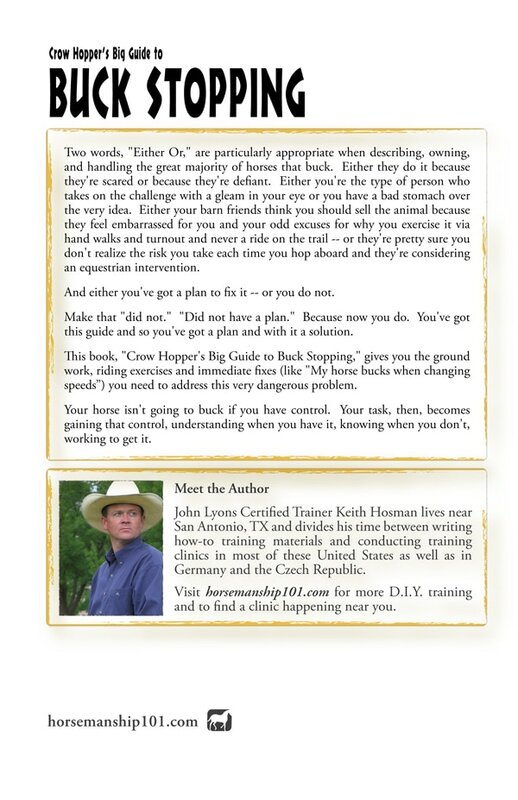 Section IV: Training appropriate for every horse and rider--and a must for those schooling the bucking horse. Your horse isn't going to buck if you have control. Your task, then, becomes gaining that control, understanding when you have it, knowing when you don't, working to get it.